I grew up making lots of caramels; seemed to become a Sunday thing. Most of the time the caramels never made it to the wrapping stage. No one could to wait until they were completely cooled before cutting into the gooey pan of yumminess! 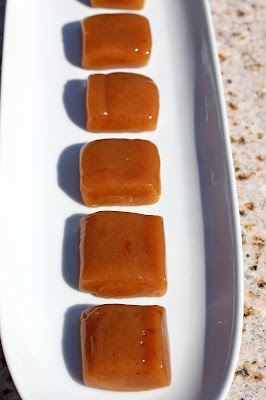 I came across this adaptation on Our Best Bites and it's a great change to regular caramels, especially in the fall. Pour cider into a medium saucepan and boil on high for about 20 minutes or until the cider is reduced to 1/3 c. Keep an eye on it...it might try to run away. Set aside to cool. Line an 8" square pan with parchment paper, making sure to leave about 1" hanging over the edges for easy removal. Coat with a bit of vegetable oil and set aside. In a small bowl, combine 2/3 c. cream, cinnamon, nutmeg, allspice, and reduced apple cider. Set aside. In a large, heavy saucepan, combine the sugar, 1/3 c. whipping cream + enough water to reach the 1/2 c. line on the measuring cup, and corn syrup. Cook over low heat until the sugar dissolves. Insert the candy thermometer and simmer until the syrup reaches 234 degrees. Remove from heat and pour the caramel into the prepared pan. Let the mixture cool completely at room temperature or in the refrigerator. Cut the caramels into 1/2″ squares and wrap each caramel in wax paper. Store in an airtight container or in the refrigerator for up to 2 weeks. (I like to store mine in the freezer and pull out one for a quick treat).